Just read this in Wired Magazine. According to Girl Scout Cookie sales data, here's how the cookie crumbles. 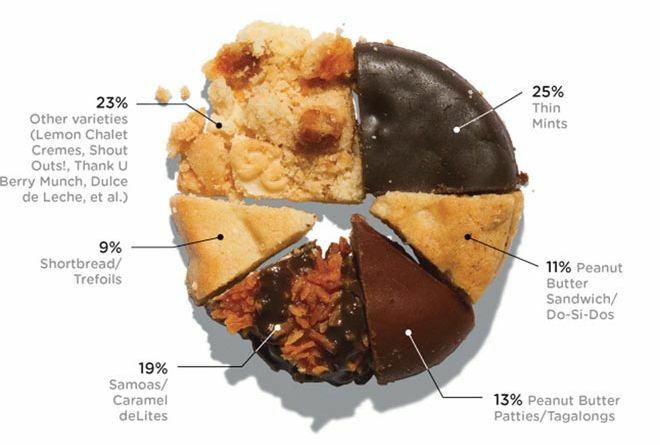 Most popular cookie is Thin Mint, followed by Samoas. BUT! If you combine the Peanut Butter Sandwich and Peanut Butter Patties, peanut butter cookies are very well represented, in fact inching out Samoas. Go PB! I hope I've gotten you in the mood; it's almost Girl Scout Cookie Season. This concludes today's cookie report. I'm surprised that Peanut Butter Sandwich cookies didn't do better. I love them. Also, I didn't realize Thin Mints were so much more popular than the rest. I had fun studying all the stats. Thanks for sharing!